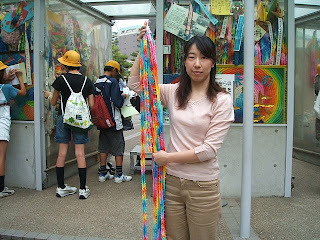 1,000 cranes made last year by Lil MDG volunteers right before they were dedicated at the Hiroshima Peace Memorial Museum in Japan. According to Japanese tradition, if you fold 1,000 origami cranes, the cranes will grant you your heart's desire. In the spirit of peace, a local student activism group is inviting the public to join them March 13 from 1 to 3 p.m. for Lil’ MDGs Thousand Cranes for Peace Origami Workshop at the Derry Public Library in the Paul Collette Conference Room. During this event, registered participants will be making origami paper cranes that will be sent for dedication at the Hiroshima Peace Memorial Museum in Tokyo, Japan. No prior experience with origami or folding paper cranes is required. Participants will receive instructions on folding on the day of the workshop. The goal is for 1,000 papeer cranes. Those who attend will also be eligible for a ticket to Disney through the Give a Day, Get a Disney Day national volunteer initiative. To qualify, you must register online for this workshop by going to: www.disneyparks.com and searching for activities in zip code 03038. Locate the Thousand Cranes for Peace Origami Workshop posted by Lil' MDGs and follow the instructions posted there. If you already know how to fold origami paper cranes and would like to sign up to assist other volunteers at the workshop, please send an e-mail to Kristen McDonalds at kristen@lilmdgs.org or call Lil’ MDGs at 603-722-0414 to register yourself as an instructor for the Give a Day. Get a Disney Day event. Lil’ MDGs was founded by three children, all under the age of 9, in 2004. Today, Lil’ MDGs has more than 20,000 children volunteering for them in 40 countries. Lil’ MDGs is now an initiative of Derry-based Jayme’s Fund and s is supported by various national and international organizations and corporations, including, but not limited to, the United Nations, Pepsi, Nestle, Coca-Cola, the U.S. Environmental Protection Agency, Disney, The George Lucas Education Foundation, the We are Family Foundation, and President Obama. To learn more about Lil’ MDGs, and to get involved check them out on the web at www.lilmdgs.org.